BERN, Switzerland, August 14, 2013 (ENS) – A husband and wife research team has provided the first video-based observation of apes that can swim and dive. Instead of the usual dog-paddle stroke used by most terrestrial mammals, these animals use a kind of breaststroke. The studies were conducted by Renato Bender, who is working on a PhD in human evolution at the School of Anatomical Sciences at Witwatersrand University in Johannesburg, and Dr. Nicole Bender, who works as an evolutionary physician and epidemiologist at the Institute of Social and Preventive Medicine at the University of Bern in Switzerland. The researchers’ main focus is primates’ interaction with water. They studied a chimpanzee and an orangutan in the United States. These captive primates were raised and cared for by humans and have learned to swim and to dive. “We were extremely surprised when the chimp Cooper dived repeatedly into a swimming pool in Missouri and seemed to feel very comfortable,” said Renato Bender. To prevent the chimp from drowning, the researchers stretched two ropes over the deepest part of the pool. They report that Cooper became immediately interested in the ropes and, after a few minutes, he started diving into the two-meter-deep water to pick up objects on the bottom of the pool. “It was very surprising behavior for an animal that is thought to be very afraid of water,” said Renato Bender. Some weeks later, Cooper began to swim on the surface of the water. The orangutan Suryia, who was filmed in a private zoo in South Carolina, also possesses this rare swimming and diving ability. Suryia can swim freely up to 12 meters. Both animals use a leg movement similar to the human breaststroke frog kick. While Cooper moves the hind legs synchronous, Suryia moves them alternatively. The researchers believe that this swimming style might be due to an ancient adaptation to an arboreal life. Most mammals use the so-called dog-paddle, a mode of locomotion that they employ instinctively, which means an unlearned, species-wide behavior. Humans and apes, on the other hand, must learn to swim. The tree-dwelling ancestors of apes had less opportunity to move on the ground. The scientists say they developed alternative strategies to cross small rivers, wading in an upright position or using natural bridges. They lost the instinct to swim. Humans, who are closely related to the apes, also do not swim instinctively. But unlike apes, humans are attracted to water and can learn to swim and to dive. “The behavior of the great apes in water has been largely neglected in anthropology. That’s one of the reasons why swimming in apes was never before scientifically described, although these animals have otherwise been studied very thoroughly. We did find other well-documented cases of swimming and diving apes, but Cooper and Suryia are the only ones we were able to film. We still do not know when the ancestors of humans began to swim and dive regularly,’ said Nicole Bender. “This issue is becoming more and more the focus of research. There is still much to explore,” said Renato Bender. 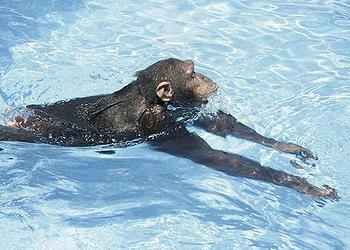 The swimming strokes peculiar to humans and apes might be the result of an earlier adaptation to an arboreal life. For many years, zoos have used water moats to confine chimpanzees, gorillas or orangutans. When apes ventured into deep water, they often drowned. Some argued that this indicated a definitive difference between humans and apes: people enjoy the water and are able to learn to swim, while apes prefer to stay on dry land. But it turns out that this distinction is not absolute.